Believe it or not, UpToDate recommends honey as first aid for button battery ingestions. Perhaps we should look at the evidence. We know button batteries can cause nasty and sometimes lethal caustic oesophageal injury. This study was a cadaver and live American Yorkshire piglet model looking at potential pH neutralizing agents prior to definitive endoscopy. In vitro, they tested the final tissue pH of cadaver oesophagus after installation of various products. They included different kinds of honey, Carafate, apple juice, orange juice, Powerade, Gatorade, maple syrup, simulated saliva and 0.9% sodium chloride control. In the lab, the honey and Carafate seemed to work the best and underwent further study. Bring on the live pigs! 9 anaesthetised pigs had a button battery placed in their oesophagus for an hour. (Poor creatures.) Serial irrigations of study solution occurred every ten minutes starting at the five-minute mark. 2 pigs got honey, 3 got Carafate, and 4 got saline control. On day 7, the unfortunate piglets were euthanized and histology obtained. Honey was the big winner! They had much less depth of injury. 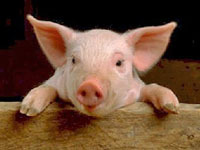 Half of the saline piglets had delayed oesophageal rupture. This little piggy went to market… to get honey! Give honey for button battery ingestion. This recommendation is based on TWO anesthetised pigs that got honey. This is extremely low-quality evidence. One should only change practice based on such low-quality evidence if the treatment or therapy was considered to be extremely low risk. Perhaps honey is extremely low risk. But are we certain? Perhaps risk may be minimal… But changing practice based on two honey glazed pigs? ?